Hey, there's a lot of stress to planning any event that requires music for mood and dancing! You want to make sure everyone has a great time with as little hassle to you, the party planner or organizer, as possible. Mr. Entertainer can come to your rescue on this one! Mr. Entertainer as your DJ, hired sound professional and event sound guru, will help you put together a truly terrific event. But take wedding receptions, for instance. A good DJ or sound entertainment company acts as the Master of Ceremony to announce guests, the arrival of the bride and groom, and to inform the guests of everything from the opening of the buffet line, to the cake cutting, to the filling of glasses for the toast. Good DJs keep the dance floor hoppin' and help create heart-tugging moments such as the dance with the Bride and her Father. Karaoke is an increasingly popular party option allowing your guests themselves to become the main entertainment. Karaoke mixes a music track and a live microphone to translate your shower time vocalizations of "Fly Me to the Moon" into an amusing Sinatra-esque rendition for the swooning crowds at your company Christmas party. 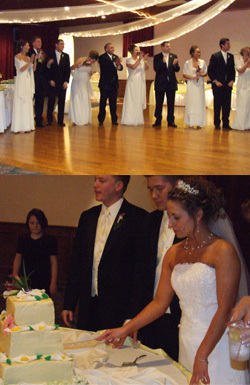 Most Brides and Grooms agree the entertainment makes or breaks all events! The advice for a Bride and Groom when choosing your entertainment is to first "value shop" your entertainment and not "Price shop". Some great questions you should ask yourself when hiring a wedding dj are what is the role of the entertainer. Do you need your entertainer to just push play, or must they also fill in as the roles of host, emcee, coordinator, entertainer, as well as the DJ? Does their personality fit in with the Bride or Groom's? How do they interact with a crowd? How do they dress? Do they partake of the alcohol at the event? What time will they arrive? Do they have insurance? Is there back-up equipment on location? Are they full-time entertainers? Asking these questions will provide the Bride and Groom with the opportunity to get the feel for their entertainment to come. More DJ Wedding and Event Tips Coming Soon!